With ZUN's permission, Sony has launched a project to release Touhou fan games on PlayStation consoles. The project will start with Mysterious Gensokyo 3, Touhou Soujin'engi ~ The Genius of Sappheiros, and Touhou Sky Arena ~Matsuri~ on PlayStation 4, with more games to come in the future. Depending on the wording of the announcement, the initiative may even extend to other doujin games that are not Touhou. 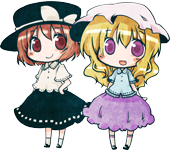 However, it is not known whether the official Touhou games will be released. See cuc's post below for the significance of the project. Tweets by various participating developers indicate the project is still in an early stage. Nothing is set in stone about which game they will port, and to which platforms. Project name is now "Play,Doujin!" More info in later posts. T'was just announced at Sony's pre-TGS stream. So yeah, more information will be forthcoming, but they showed off footage from a number of official and doujin touhou titles. I think I may be finally getting a PS4. What about the ones going straight to PS4? And does this mean Touhou is finally going commercial? You can publish on console and still be considered an indie dev. Another thing, how will translations be handled on console releases? Today's announcement is for Touhou fan games only. Namely, Sky Arena, Mysterious Gensokyo 3, and Genius of Sappheiros. While the trailer contains images of DDC, it is unconfirmed at this point that the official games will come console-side. Calm down a bit. I'm busy at the moment, and will attend to things later. Is that pic in the Twitter from somewhere? These are all doujin works released by various circles. The first games shown were Fushigi no Gensokyo 3, Genius of Sappheiros, Touhou Sky Arena Matsuri (all labeled under "Round 1"); then they showed Marisa and Alice's Trap Tower and a bunch of others. They make it very clear throughout the whole trailer that it's all derivative works / fanmade games. Well, you'll never know if it's a teaser for something. Still, having derivative works appearing on a home console is a pretty big news for the series. Maybe I'm strange, but I find this development peculiar. I mean these are basically PC fangames that are being ported to the Playstation. It just rubs me the wrong way. By the way, very soon there will be a thing, not from me. I won't say what it is yet. The context is that he tweeted it during a few minutes before the announcement as a tease. It's only fan games, going by the video. From the looks of things, ZUN's basically giving these developers and Sony the OK to release them on the PS4. Nothing as far as the official games though. However, the video mentions "Touhou AND doujin games" so it's possible ZUN could be releasing them at a later date. In fact his tweet that Drake linked to basically said "For the near future, I'm not releasing anything" could be a subtle hint. Or I'm just reading too much into it. I really wish it included the Vita too but this is making a PS4 look a bit more tempting. Like I said, it's not "near future", the tweet was made before the announcement, he meant "soon there will be an announcement, not from me." There ought to be a specific term for the phenomenon where a creator's denial of doing/being about to do something is taken by fans as a "tease" or even confirmation of that very same thing. I'd say this announcement was on my list of "things that I would never ever have expected to see happen", but the reality is that it's still so out of left field I would never have thought to put it on that list. I'm still sitting here like "what"
Even if it's just fangames, they at least got permission to use G Free in their promo video. I think there may be a game produced exclusively for the PS4, but it's non-canon and ZUN doesn't have involvement, other than, perhaps, helping with getting it released. Also, I still haven't gotten an answer to where that pic in the Twitter originally came from, or is it made specifically for the announcement? Also, I still haven't gotten an answer to where that pic in the Twitter originally came from, or is it made specifically for the announcement. And not an old one either, but one of their newest releases. A lot of doujin games use a 4 button control scheme that's extremely easy to map to a controller. Heck, I played Genius of Sappheiros with a controller. Obviously the programmers are going to have to do some extra work to port them, but I don't think there's any particular design obstacle. They were probably only on the PC in the first place because it's easier to program and sell. Thanks for linking to the website! Everything makes sense to me now. As you can see, the company responsible for this project is called "Mediascape". According to its own profile page, the president of the company is Nozomu Ezaki. Google tells me, Nozomu Ezaki is none other than ZUN's buddy, D.N.A., of the doujin circle D.N.A. Softwares. As I have written before, D.N.A. has always been helping with ZUN and Tasofro on the business side of things. In other words, the company that will be publishing Touhou fan games on PlayStation systems is ZUN's own people, not some outsider. The website also has a contact page, which fan game developers can use to apply for this publishing program. When earlier this year, ZUN said he wanted to do something big to help doujin game developers, I suspected he wanted to create his own platform for doujin games, but couldn't imagine the logistics of this platform. Now we know that his plan is to use D.N.A. 's company to do the publishing, to build on Sony's console platform, and to lead the project with Touhou fan games. Bravo, ZUN and friends, these sound like smart moves. P.S. : It happens that yesterday ZUN participated in the PoriPori Club web stream, where he talked with the editor-in-chief of Famitsu magazine, and tommorrow D.N.A. will attend a game industrial panel and discuss the status of indie games. Makes sense that one of zun's buds is behind this because this should show that claims of ZUN being a sellout or what not are unfounded speculation and that he's not doing this willynilly. Giving a hand-up for indie doujin game developers is a pretty puritanical way to define "selling out", so I wouldn't worry about those people tbh. Oh god! Somebody must tell Sanbondo to release Gensou Shoujo Taisen 4 as a compilation with all the games of the series for PS4.